Grip Guard safety stair nosings are manufactured from reinforced aluminum extrusion, milled in a square faced profile and anodised to provide a long term, attractive safe solution. Grip Guard nosings are designed to meet the requirements of AS1428.4 and is available with a range of high visibility polymeric and carborundum inserts to provide a safe environment both inside and outside. In accordance with The Building Code of Australia and the Disability Discrimination Act (DDA), it is mandatory to provide a insert depth of between 50 and 75mm in depth on all steps. 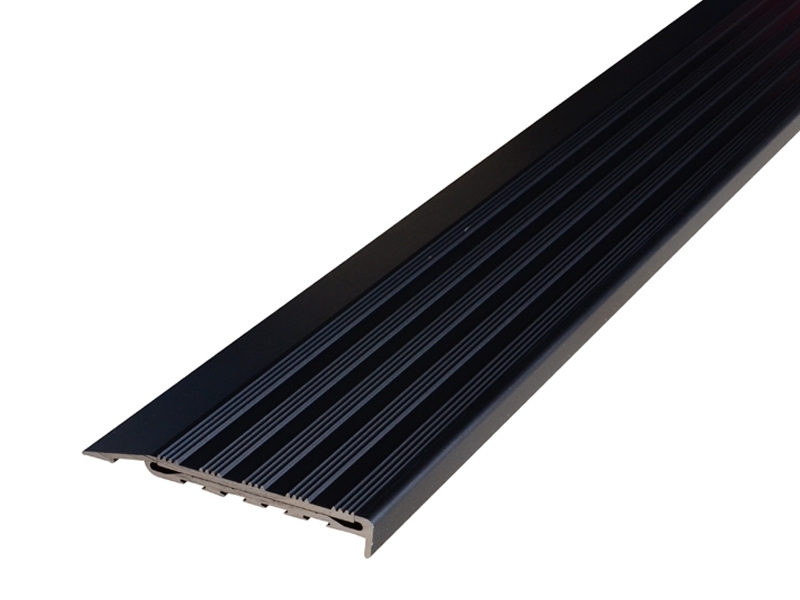 Designed and manufactured as an attractive, durable stair edging for a variety of applications, it is particularly suited to heavy traffic areas. 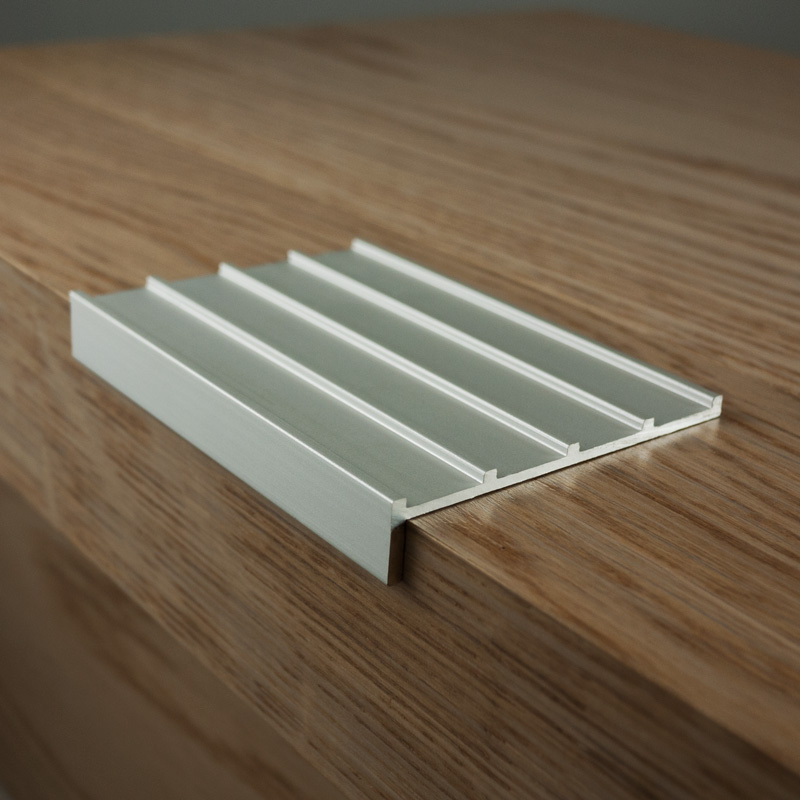 The range consists of four purpose-designed edgings that use the ProStep Insert System, comprising of P4 rated rubber/aluminium or P5 rated Carborundum inserts, available in six colours or our new photo-luminescence carborundum combo strip inserts. ProStep is the best option when you need a good looking, hard wearing stair edging that meets all relevant Australian Standards and the latest NCC requirements. It's perfect for both internal and external applications, can be fitted to new or existing concrete, ceramic tiles, timber, carpet and most other hard surfaces. An elegant, soft linear finish combining Classic aesthetics and durability. It comes in an A series (10mm) as well as Standard (25mm) in Natural Silver and Black. Light duty, square faced, slim line version of the ProStep® Classic. It comes in an A series (10mm) as well as Standard (25mm) in Natural Silver and Black. Purpose engineered with increased strength for carpet applications. It comes in an A series (10mm) as well as Standard (25mm) in Natural Silver and Black. P5 rated, tough and durable, the Carb insert is manufactured from Carborundum ensuring it is the perfect choice for a attractive non-slip stair nosing. Ideal for egress ways in schools, hotels, restaurants and sporting facilities. Available in black, grey and yellow. This P5 rated insert has all the features of ProStep® Carb, but with the added benefit of a photo-luminescent leading edge greatly increasing safety of in low light conditions. It is perfect for internal and external, high traffic situations. Available in black, grey and yellow. ProStep® Ridge is a rubber insert manufactured as an attractive ridge surface. Easy to clean, it has a P4 anti-slip rating and is suitable for all internal applications. It is perfect for light traffic internal use. Available in black, grey, yellow, ivory, terracotta and ocean blue. ProStep® FineLine is similar to the Rib insert, but with a finer surface. Easy to clean, it has a P4 anti-slip rating and is suitable for all internal applications. It is perfect for light traffic internal use.Available in black, grey, yellow, ivory, terracotta and ocean blue. The Grip Guard Ribbed Polymer range allows for installation onto all substrates including specific profiles for broadloom carpet and direct stick. 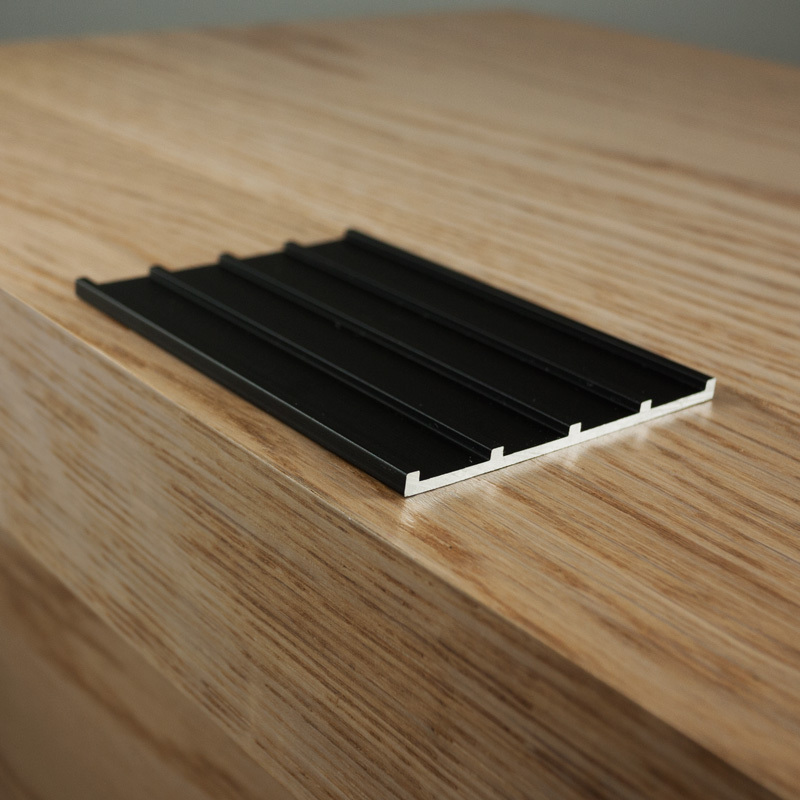 These stair nosing’s offer a wide range of coloured inserts which both compliment the surrounding landscape/building design, whilst simultaneously concealing all required screw fixings. Suitable for indoor use only. Perfect for timber, Concrete, Stone Tiles, Ceramic Tiles, Direct Stick Carpet, Broadloom carpet. SafeLine is a cost effective stair nosing manufactured from a unique combination of aluminium oxide and a thick plastic carrier, providing a flexible yet durable anti-slip solution. SafeLine Step is a hybrid alternative that combines the best features of the ProStep and PosiTread ranges. With the durable, P5 safety of the ProStep Classic, and the clean, minimal aesthetic of the PosiTread range. It is suitable for both internal and external use and provides a cost effective safety stair nosing that doesn’t compromise on aesthetics. The P5 safety rating of these nosings are the highest in the industry. Supplied cut to length up to 3.6cm with the SafeLineTape applied, DIY installation is easy to achieve with a suitable adhesive. Available as both an angle and a tread, the SafeLine Step uses the SafeLine range of strip insert safety tapes, which are manufactured from a unique combination of aluminium oxide and a thick plastic carrier to provide a flexible yet durable anti-slip solution. SafeLine Twin includes the SafeLine range of strip insert safety tapes, which are manufactured from a unique combination of aluminium oxide and a thick plastic carrier to provide a flexible yet durable anti-slip solution. The P5 rated tape inserts are formulated to resist water, steam and detergent and will withstand continuous temperatures in the range -30ºC to 120ºC. 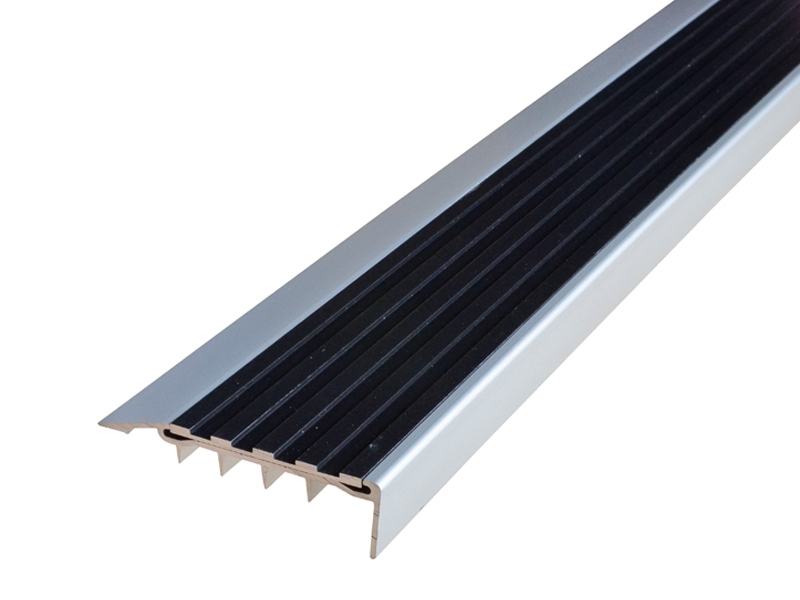 SafeLine Twin stair nosing comes with the SafeLine insert preassembled, which are pre-cut to length and pre-drilled, and supplied with fixing screws and star plugs. Available in four different styles, and as both angles and treads, PosiTread is a sleek, architectural option that will enhance the aesthetic of any space. 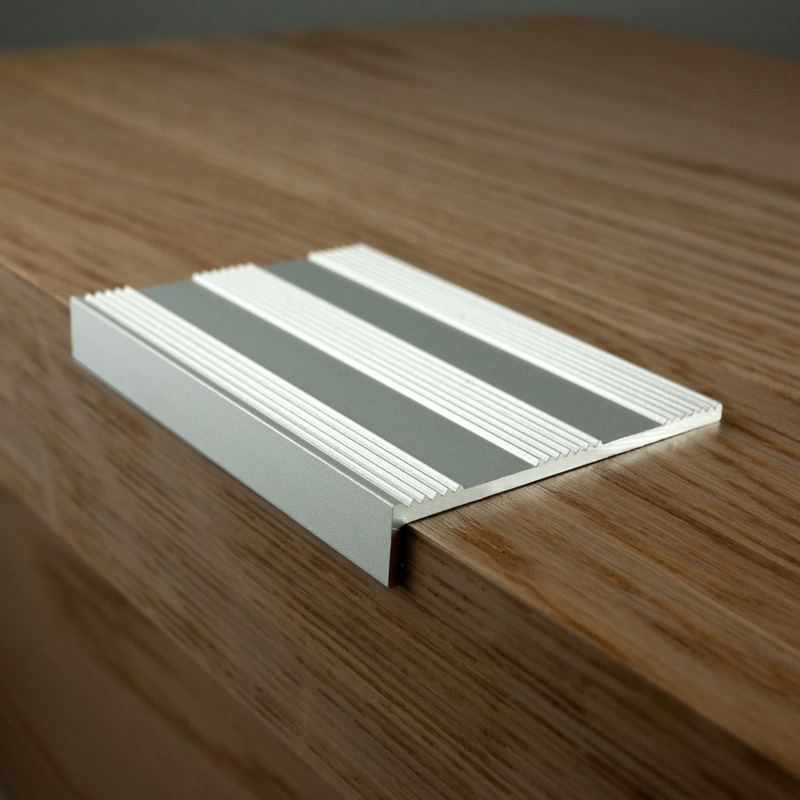 Manufactured from hard anodised aluminium, it features great looks without compromising on safety and is the first choice for many specifiers when looking for a low profile stair nosing that complies with all standards. 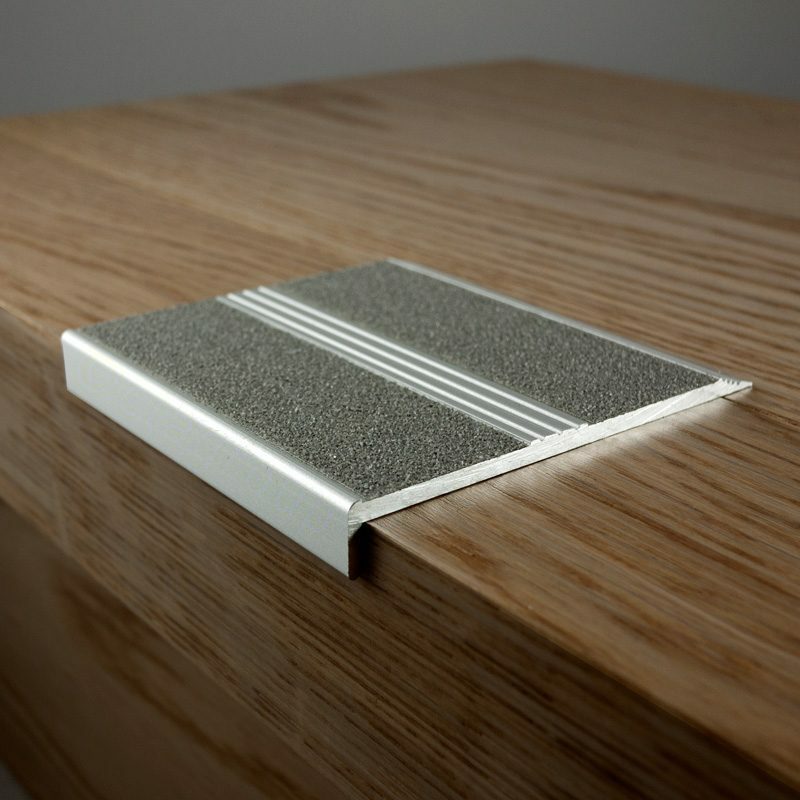 It is supplied to a length of up to 3.6m and installed directly onto stair treads using suitable adhesive. PosiTread is available with P4 or P5 anti-slip rating so is suitable for use in both wet and dry environments. Finished in natural silver, black or brushed black aluminium, its is backed by five year manufacturers warranty and is perfect for light traffic areas both internally and externally where an architectural finish and safety are paramount. Perfect for timber, Concrete, Stone Tiles, Ceramic Tiles, Direct Stick Carpet. 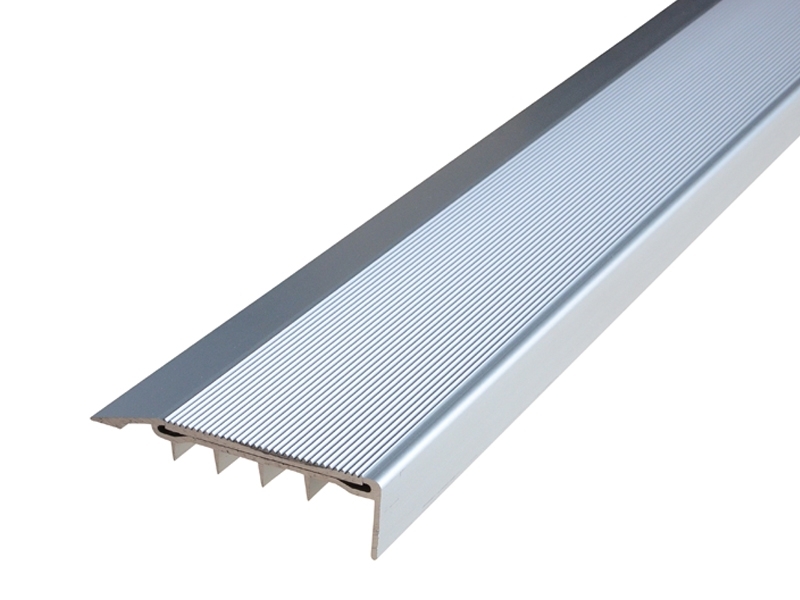 The Grip Guard Aluminium Extrusion stair nosing range is P5 rated and suitable for both internal and external applications, providing a non-slip surface in oily, wet, dry or soiled conditions. Carborundum is UV stabilised and manufactured from silicon carbide. (The hardest material on earth next to diamond.) It is impact, chemical and corrosion resistant; however, it is also very abrasive making it less suitable for barefoot traffic areas. The Carborundum inserts are available in a variety of colours that have been matched to complement our Tactile Ground Surface Indicator (TGSI) range. Our specially formulated ‘glow in the dark’ Carborundum is highly visible making it particularly applicable in areas where low light conditions from power outage or smoke may occur. This range is available in black, silver, blue, red, yellow and photoluminescent colours in silver anodised and black anodised profiles. Designed for heavy traffic situations, HiLight range provides the highest level of slip resistance and is perfect for stylish public areas. 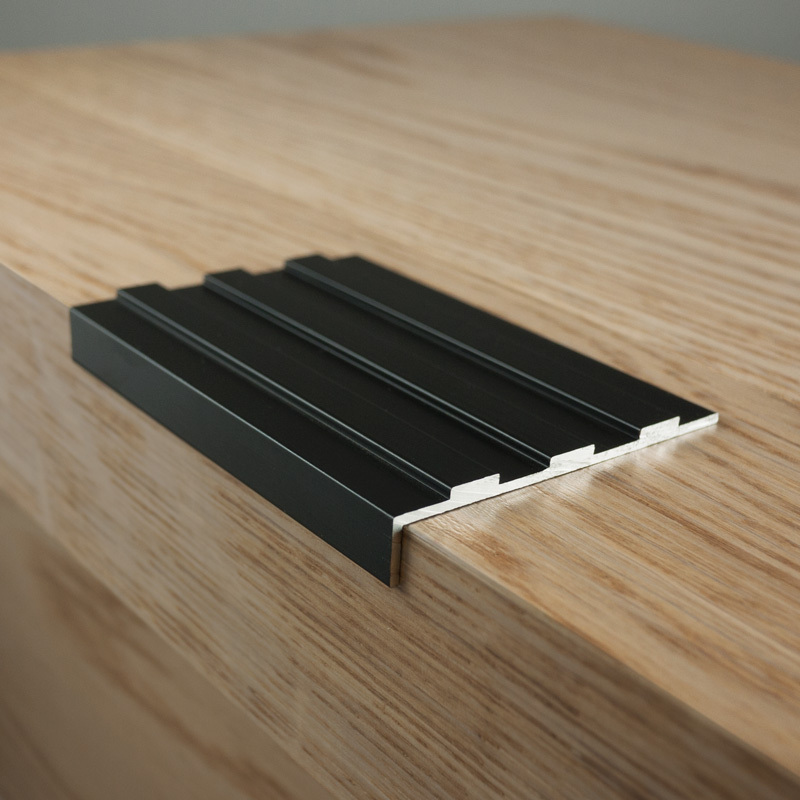 HiLight range of ribbed safety stair edging combines premium performance and aesthetics with maximum flexibility. 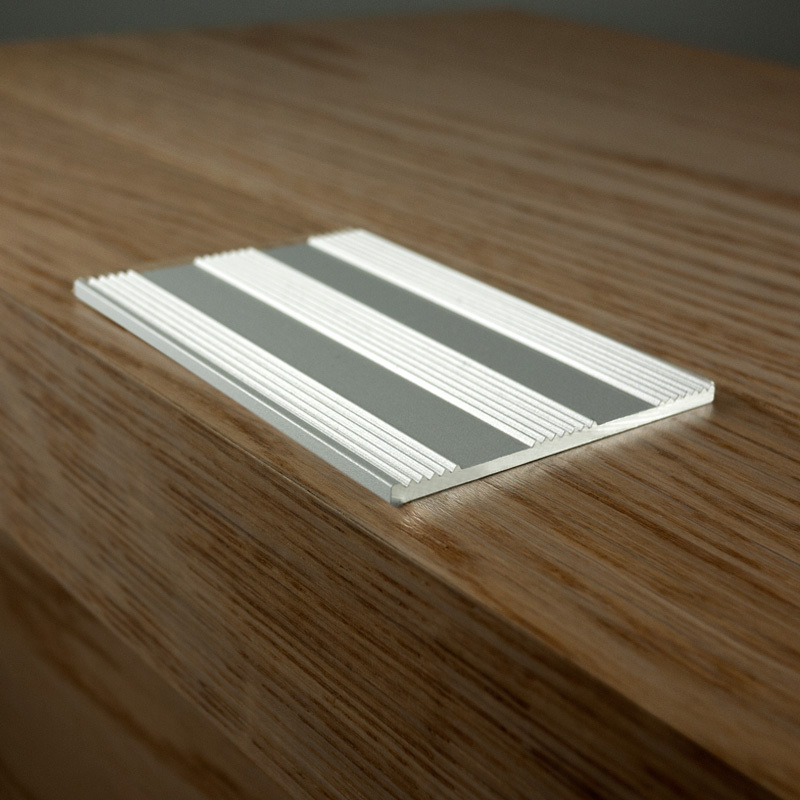 They provide the highest level of slip resistance, with an extremely high P5 rating and are available in FiveBar, FourBar and ThreeBar variants and in surface mount, recess and inlaid options that come in natural silver and anodised black finishes. HiLight series have a range of applications and are perfect for heavy duty internal and external applications, the recess and inlaid options are suited to new applications where a recess is allowed, while the surface mount option is perfect for retro fitting. P5 rated, tough and durable, the HiLight Carb insertis manufactured from Carborundum ensuring that it is the perfect choice for an attractive non-slip stair nosing. It comes in ivory, yellow, grey and black colours. • Available in 3 insert colours: black, safety yellow and grey. • Ideal choice for seamless design, where safety is incorporated within the stair tread. • Ideal for retrofitting to stairs where allowance for recessing has not been made or is not feasible. 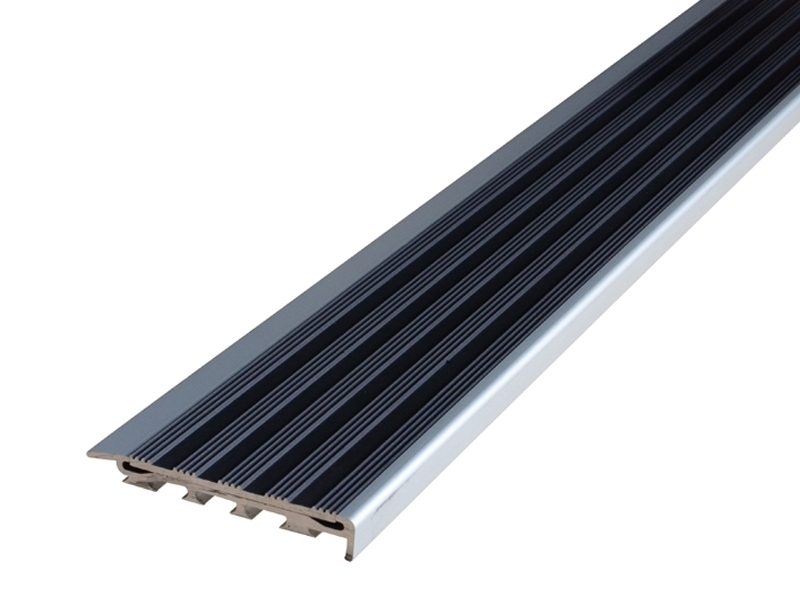 Available in silver anodised and black anodised profiles, the SlimLine Plus is P5 rated range of stair nosings. 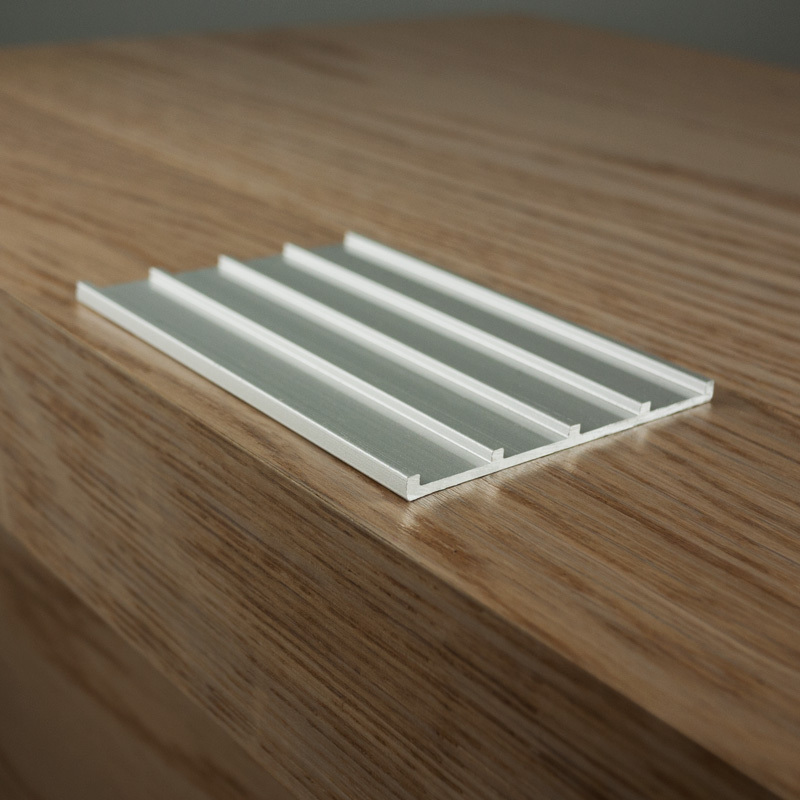 They come in a variety of coloured inserts manufactured from one homogeneous piece of premium aluminium while providing designers with options for seamless integration of the stair nosing with surrounding finishes, whilst allowing any unsightly screw fixings to be concealed. The SlimLine range allows for installation onto all substrates including specific profiles for broadloom carpet and direct stick. This hard wearing and corrosion resistant nosing is fully code compliant and offers an aesthetically stylish and non intrusive stair finish.